Many of you will already be aware of our recent trip to Thessaloniki, however for those of you who don’t know, here’s a quick introductions before we get into the finer details. Irene’s cousin Pano had visited Greece last year in association with Dentaid to help provide dental care and aid for refugees. After hearing the stories of poverty and ill-health, we knew straight away that we wanted to do something to help too. So, after very little discussion, we were all in agreement that we too would offer our services to refugees in 2017 as part of a programme put together by Dentaid and The Health Point Foundation. 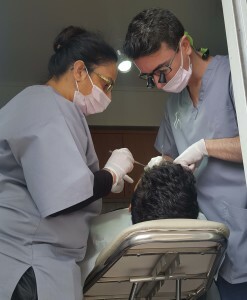 However, this time we wanted to not only offer dental care, but also donate non-perishable food and clothes to help improve the overall quality of life of refugees in Thessaloniki who really have very little. 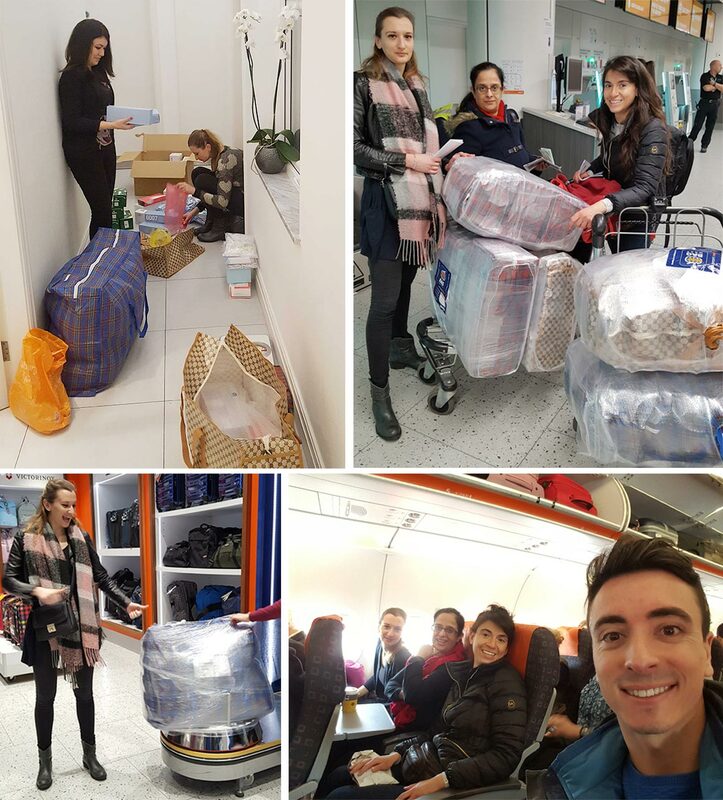 So here’s what happened when team KDS went to Thessaloniki, we’ll start with the preparations…. We had been campaigning for a little while and we were truly overwhelmed with the sheer amount of support we received from patients, friends, families, companies and even the general public; it seemed everyone wanted to help which was great. We were due to leave at 5am in the morning, but we were still packing up donated materials into the night. Martina, our receptionist, was fantastic and somehow managed to co-ordinate our whole trip from parking, flights and booking on the extra luggage (despite materials still arriving the day before we left). Loading the car that night we felt very grateful to have some of our patients come and wish us well on our trip. As the car was loaded with 5 suitcases of supplies, it was more like a game of tetris and proved to be quite comical! 5am came around very quickly indeed. We met at the airport where Ginny and Maria had fun ‘cling-filming’ the suitcases; Cesar opted for a quick coffee instead! The flight was a short 3 hour trip which was filled with excitement about the days to come; Ginny and I didn’t stop for talking all the way there, we were just so eager to help. We arrived in Thessaloniki, the second largest city in Greece, a little after 3pm. The city is the closest city to the border which means it is the easiest way for refugees to make their way into Europe. If you’ve visited Thessaloniki, you’ll know it’s quite a large city and incredibly vibrant. The city is full of amazing restaurants, many of which only serve authentic greek food which was delicious; we seemed to consume rather a lot of it on our trip (but we’re not complaining). The city sits on the coast and the sea looks spectacular; so deep and blue. That evening, we met up with a couple of my friends in Greece, but as we started work in the morning we couldn’t stay too long. The camps of Thessaloniki were a far cry from the beauty of Thessaloniki, although refugees worked to try and keep them as clean and functional as possible. On the first day we met at the Sinatex Warhouse, a strict camp that had been established for over a year now. The Health Point Foundation team had got us all clearance before we arrived and we were therefore accepted by the military who guarded the camp. The military were very welcoming and genuinely happy to see that the refugees were receiving the care they needed. This specific camp only had around 120 refugees, we were told a further 300 had been relocated to local apartments. In the camp, there were a number of specifically made barracks which despite being tiny, housed up to three families. These families had previously lived in tents with very few facilities, so the improvement is significant. The relocated families had been moved with the help of funding, although this is soon to run out so the future is very uncertain. I can’t imagine how difficult it must be to be living with this uncertainty, knowing you could be back in the camps again one day soon. On the first day at the camp we treated a total of 17 patients, 8 of whom were under the age of 18. The treatments included fillings, extractions, extirpations and scaling. The conditions were nowhere near ideal and we found it quite difficult to treat people. This being said, since Pano visited 6 months ago, they have used donations from volunteers to purchase a suction pump and a fully-foldable dental chair to speed up treatment times; they previously used a massage table. The second chair however was very basic and although we had some drills to compete restorative work, we were very limited and everything took much longer to complete. It just shows how useful technology has been in providing a better experience for both dentists and patients. 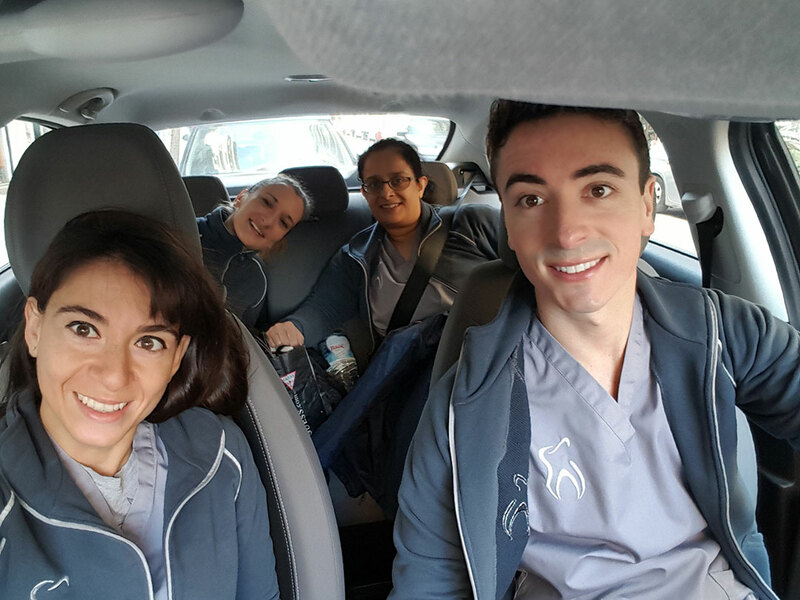 The process of treating refugees is becoming more efficient thanks to Hassan Rayan and Radwana, as well as other HPF members. Volunteers who have been giving up their own time to help. 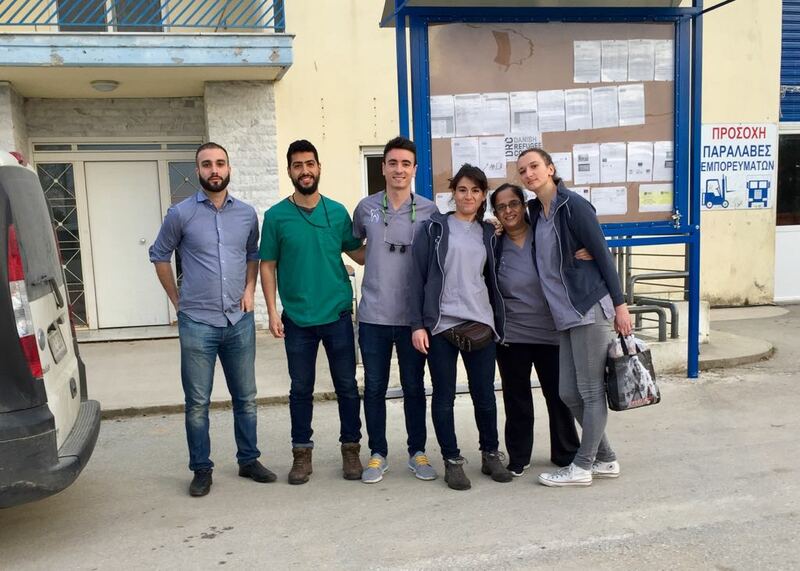 They have dedicated their time here to offering care to refugees, but also play the translator role for volunteers who arrive in Greece through the Health Point Foundation. 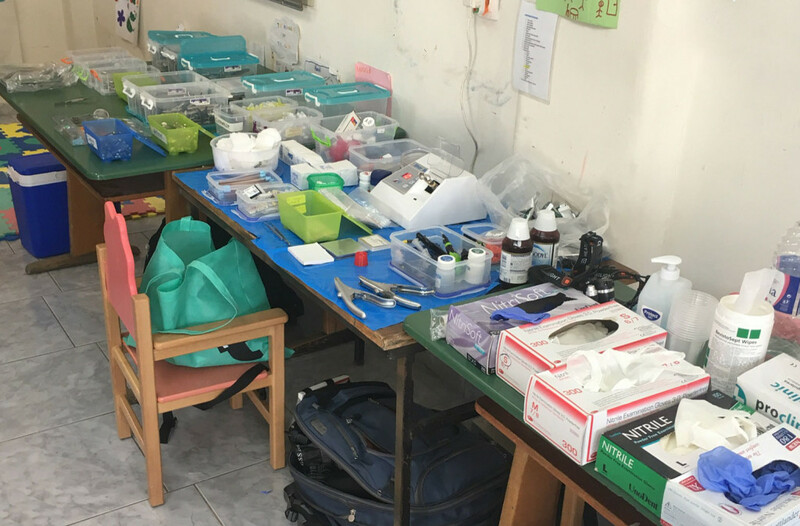 All materials are stored in a very ordered fashion and the team now have enough instruments to get them through a day of treatments without the need to sterilize them for reuse. The team can then get on with treatments before sterilising all the instruments at the end of the day at base camp. Day two was spent at a local apartment giving care to the refugees who had been rehomed. The patients we saw were educated, many of them came from wealthy families yet were forced to flee their homes and leave everything behind. Their lives had changed completely, yet it was humbling to see how they had adapted to a situation they have unfortunately had to accept as normality. It really hit home how quickly a person’s life can be dramatically changed, and not always for the better. These people had come to see us because they were in pain, their only requests were: ‘please get me out of pain’ or ‘can I keep my teeth please’. Although they didn’t know or understand us, there was an inbuilt level of trust between us; they knew we were there purely to help. We treated a total of 19 patients on day 2, 6 of whom were under 18. At the studios, we provide care that lasts and addresses the problems to reduce the chances of it further complications down the line. However, in Thessaloniki we couldn’t always do this and that was hard to accept. Sometimes the patient’s pain was coming from multiple teeth and we needed to respect this and treat all teeth that were causing the pain despite the fact that we had a queue of people waiting outside. Other times it was difficult to diagnose which tooth was causing the pain. We didn’t have any X-Ray facilities and sometimes multiple teeth were affected. It was difficult to make the decision to leave some teeth and treat only the pain, knowing that these teeth would later cause problems. It was definitely challenging and the patients appreciated this and knew that the Health Point Foundation team would be back at some point to help again. We found it difficult to adapt to the circumstances in the camps and work with limited facilities. Although by day 2 we were working as well as we do at The Studios, this was purely down to our close-knit team and the fact that we know how each other work. I would definitely recommend coming for more than 2 days in order to feel comfortable with the facilities and be able to provide the care that is necessary. 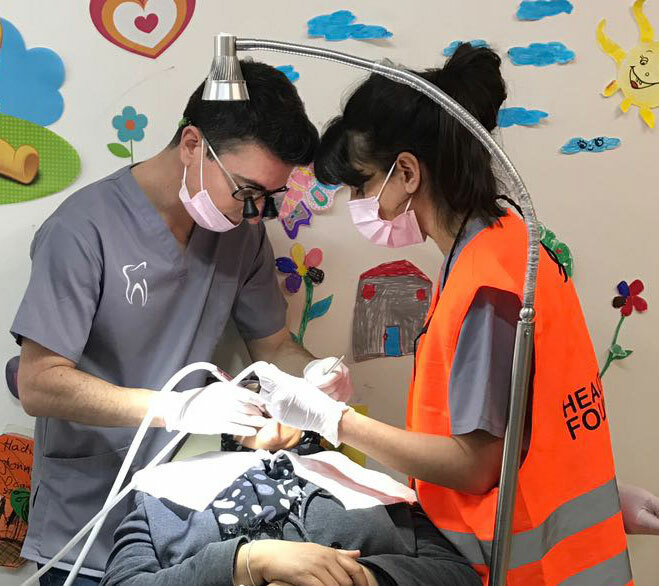 We have nothing but respect for the Health Point Foundation, and especially Hassan, Rayan and Radwan (a dental student from Libya), who are changing lives on a daily basis. We’re very grateful of the experience and hope to continue supporting refugees around the world. A special thank you to Premium Plus and GC UK for their kind donations of materials and to Henry Shein for all their help during our preparations.